Welcome to MCO’s Military Members Committee Information Center. Here you’ll find information on the committee and how you can get involved. The Committee was created for MCO members who are current or former service men and women and their families. Service men and women have unique challenges – whether it’s facing deployment, getting re-acclimated to civilian life, or navigating Veteran’s Affairs. If you’d like to get involved with the Military Members Committee, email Cindy Kogut. Below is a list of posts on our Military Members Committee’s news. This page will update frequently, so check back often. The MCO Military Members Committee will be hosting a pie social at the VA Ann Arbor Healthcare System at noon Saturday, June 3. MCO members who are current or former military members are invited to join us as we serve and chat with veterans. The VA Ann Arbor Healthcare System is located at 2215 Fuller Rd. in Ann Arbor. If you are interested in attending or need more information, please contact CMO John Hassen at hassen48169@hotmail.com. The MCO Military Members Committee will be hosting the monthly birthday party at the Jacobetti Home for Veterans in Marquette. The committee will be providing cake and ice cream from 1:30 to 2:30 p.m. on Tuesday, April 25 at the Jacobetti Home for Veterans, 425 Fisher St., Marquette, MI. If any MCO military members would like to honor these veterans, please feel free to volunteer! Contact Cindy Kogut, MCO’s staff representative on the Military Members’ Committee, at cindy@mco-seiu.org to sign up. We hope you’ll join us April 25 in Marquette! All veterans, current military members, and their families are invited to a special dinner Nov. 12 at VFW Post 701 in Lansing. View a flyer here. What: A special veteran’s day dinner, hosted by VFW Post 701’s auxiliary. When: 3 p.m. to 6 p.m. Saturday, Nov. 12. Cost: $8 per plate for adults, $3 per plate for kids. Veterans eat free. This is another great event being shared by the MCO Military Members’ Committee. All MCO members who are veterans or currently serving in the military are encouraged to sign up for the military members’ committee here. Thanks, members! 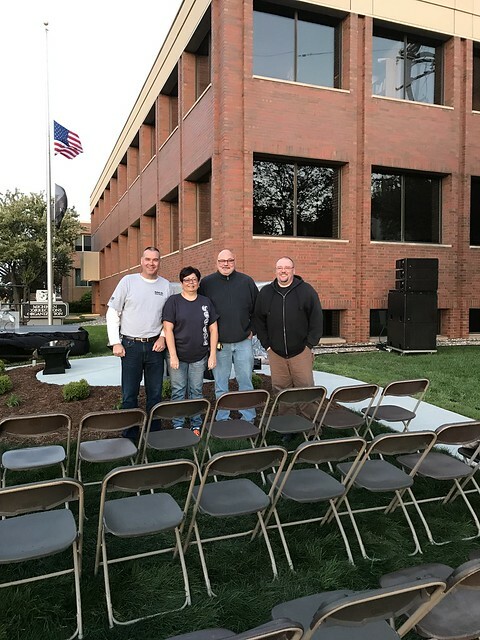 The traveling Michigan Vietnam Memorial Wall for Fallen Heroes will stop in Fowler soon, and the MCO Military Members Committee is looking for volunteers to watch over it to ensure it’s not vandalized. The Wall will be located at 126 S. Maple St, Fowler, MI 48835. Volunteers are needed Sept. 16 and 17 from 9 p.m. to 6 a.m. Times can be split according to your schedule. Any amount of time would be greatly appreciated. This is yet another good cause that the Military Members Committee is participating in. The committee is honored that the VFW Hall in Fowler reached out to MCO to make this request. If you are interested in volunteering, please send an email to Cindy Kogut at cindy@mco-seiu.org or call (800) 451-4878 x117. ORIGINAL POST 11/9:Wednesday, Nov. 11 is Veteran’s Day, and MCO would like to take this opportunity to say thank you to all veterans and men and women currently serving in our armed forces. Your sacrifice doesn’t go unnoticed. MCO is spearheading an initiative to help us better serve the many corrections officers who are retired or active military members. We know they face unique challenges – whether it’s facing deployment, getting re-acclimated to civilian life, or navigating Veteran’s Affairs. A group of corrections officers met in Clare last month as the first step in this initiative. Read about what they did or email us to get involved in the military members’ initiative. Cotton officers are planning a Veteran’s Day Cookout Nov. 10, the day before the holiday. Cotton is also hosting a candy drive. Donate your extra Halloween candy and it will be mailed to deployed troops. Toiletries are also needed. See more details about what Cotton is doing this week. Plus, veterans and currently enlisted men and woman can get all kinds of discounts and freebies on Veteran’s day, Nov. 11. USA Today has compiled a list of deals here. Here’s another list of free and cheap things you do on the holiday. And there’s still time to see Telling:Lansing, a stage production featuring actual veterans. They tell their stories of military service and how it changed them. Read the Lansing State Journal article on it here. Thanks, again, to all the MCO military members! UPDATE 11/10: Performance Plus car wash, 2130 S. State Rd. in Ionia, is offering current military members and veterans a free Top car wash on Veteran’s Day. Normal price is $14. You must show your military ID or have a veteran’s license plate to get the free wash.
Also, Red Robin is offering veterans and military members a free Red’s Tavern Double Burger and bottomless steak fries. Join more than 7,200 corrections professionals, reporters, legislators, and others who subscribe to communications from MCO. Sign up now. Here you will find information about the MCO Military Members Committee and how you can get involved.